John and Nathan, like all siblings on the entire planet, have moments where they don’t get along too well. Don’t get me wrong, they are great brothers and Nathan is reallly, really good with John. But, of course, they are still brothers. And brothers will get into spats at some point. Sometimes Nathan is the instigator, and believe it or not, sometimes John is. I keep telling Nathan not to pick on his brother because it’s going to come back and bite him. I suppose Nathan didn’t know I meant that literally. 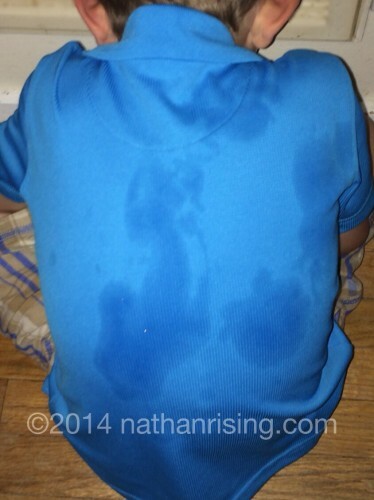 Nathan was still in time out, hunched over and sobbing with giant spit circles all over the back of his shirt. Apparently, John had bitten him all over his back while he was sitting there, leaving giant spit circles where he chewed on Nathan’s shirt as he was biting him. I had enough time to quickly snap this picture before I ran outside and erupted in a fit of laughter. I didn’t want Nathan to think I was laughing at him, but I was definitely laughing at the situation. Once I got my laughter under control, I came back inside and put John in time out and told Nathan I was impressed he stayed in timeout while under attack. Speaking of which, there was another incident where John bit Nathan. Nathan had done something to John- maybe he took away a toy John was playing with. Whatever the reason was, John retaliated by biting Nathan on the rear and clamping down with his teeth and refusing to let go. Nathan was shrieking and running around the house with John’s teeth clamped on his rear like a fox trap. There is certainly no lack of enterainment around this house! I’ve never been particularly happy with Nathan’s haircuts that we’ve paid for over the years. Combine his sensory issues with a sometimes over-zealous hairdresser and you typically end up with haircuts where his hair looked like a mushroom, or was crooked, or too short, or a combination of it all with a traumatized mom and kid to boot. I admit, he’s not the easiest kid to give a haircut to. The buzzers stress him, he does NOT like the water spritzer, the clipped hair falling on his face and neck is agonizingly itchy, and he’s just uncomfortable in general. So I decided to cut his hair myself. Mama can do a better job at keeping him mellow than a stranger, and even then the poor fellow still ends up having a screaming fit, usually from the intense itchy feeling the cut pieces of hair cause him. At least at this young age, no one cares how the cut turns out, least of all Nathan. And it’s not any worse than some of the haircuts we’ve actually paid for. The Cuts by Mama actually aren’t too bad considering I have zero training. I’m getting better and better with each cut, and I’m learning as I go. Plus it helps that Nathan is so darn cute that any hair style looks great on him! So a few nights ago, he got another haircut by Mama. There’s only one little spot that’s a little crooked, but all in all he looks quite handsome. In fact, when he came home from school after getting his hair cut, he told me he got quite a few compliments. He was very happy! I sure do love that little guy. So earlier this week, I took my sweet boys to the park for a picnic. I grabbed myself some fried chicken then got Nathan some chicken nuggets. We spread out a sheet at the park and had a glorioius meal. John mostly lurched around on the sheet, trying to take Nathan’s drink while making those adorable grunting noises that he makes. As we were eating, a small group of boys, about 5 years old, come by kicking a soccer ball. They got pretty close to smacking me with the ball, and Nathan said, “Hey guys!!! We’re trying to eat so don’t kick that ball here!” Ha ha. I love that kid. When we finished eating, Nathan bounded over to the playground to let off some energy as I cleaned up. John attentively supervised. After I packed everything back up, John and I meandered over to a bench so I could keep a better eye on the playgound happenings. That one kid with the soccerball was in the middle of all the playground equipent kicking his ball around. Literally. The kid was kicking it up onto the play structures and all over the place. He must have thought he was cool. The mother and some dude who may have either been her boyfriend or just someone she was flirting with were sitting on the swings. She appeared oblivioius to the antics of her kid and talked in this annoying high-pitched voice that oozed of low-self esteem and desperation. After a while, Nathan took notice of this kid with the soccerball. See, I’ve always taught Nathan to share. Well, he doesn’t HAVE to share if he doesn’t want to- but those things he doesn’t want to share stay at home in his room. Once he brings it out and plays with it in front of others, it’s fair game. So with this knowledge, Nathan bounds over to the kid and asks him if he can play, too. The kid, being the incredible hotshot that he thought he was, starts fancy-kicking the ball away from Nathan. Nathan has poor fine and gross-motor skills, so he finds it absolutely fascinating to watch when other kids have more advanced skills than him. Nathan sees this ball-kicking an an invitation to start playing, so he starts chasing after the boy. I watch from a distance, curious to see how this would evolve. Of course, as an adult with years of experience on my side, I already knew what would happen. I could just about smell the stench of Entitled Jerk radiating off this kid. But I wanted to see how Nathan would handle it when the inevitable occured. And the inevitable did indeed happen. After a couple of minutes of Nathan trying to kick the soccerball, the kid finally grabs it off the ground and tells Nathan to get away. I stand up, John on my hip, and start slowly walking toward them, just in case I needed to intervene. At first, Nathan, who doesn’t have a good grasp on social issues, started laughing. He told the kid that the nice thing to do on the playground is to share. The kid said he didn’t have to share. And then the hand-flapping started. Nathan, who doesn’t understand this hostility, starts bellowing (loudly!) that if the kid doesn’t share, Nathan’s going to go home and never play with him ever again. The kid said, who cares? 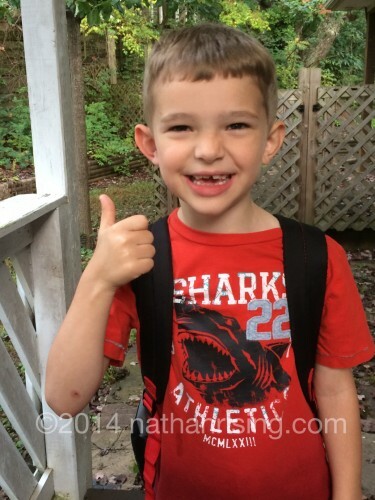 Nathan’s hand flapping became more vigorous as he started yelling that he wants to play and he wants to be friends. That stupid mother just sat there on the swing and laughed. Sensing a meltdown, I called Nathan over and whispered that some parents never teach their kids how to be good people, how to share, or even manners for that matter. I told him it might be best to stay away from jerks like that. Nathan tearfully agreed. I helped him dry his eyes and off he went to play with some other kids. I stood where I was at and stared at this mother. I really couldn’t believe she just acted that way towards my child. Apparently, I must have been putting off some don’t-mess-with-my-kid vibes because she started shifting around, eventually getting up and sitting in a few different places. And then one of the other kids started picking on Nathan- told him he wasn’t “allowed” in the rock-climbing contraption that forms a circle that kids can get inside. When he tried to go in anyway, the kid pushed him down. I called Nathan to me and told him it was best to go home rather than play with bullies who have no conscience. Sweet boy came with me to the car, crying the whole time about how he just wanted to be friends. I told him that some kids aren’t worth being friends with. It’s more peaceful to be alone than to play with mean old bullies. Poor sweetie insisted that they were going to be friends. And, as icing on the cake, as I was getting the kids back in the car to leave, this “mother” comes walking out to her car with FOUR kids in tow. All the ones that were mean. How odd. I don’t know if they were all hers- I know the one with the soccer ball was. And then the one with the soccer ball gets in the car and starts throwing baseball bats, gloves, and balls out into the road! She just looked at him as was like, “now, now.” All the kids were swarming around the side of my car as I was trying to back up, and she didn’t even try to keep them safe. I had to wait for them to move away. The more I’m around other kids, the more I start to dislike them. It’s not even the kids’ fault- it’s the parents’ fault for raising them that way. It seems there are quite a number of these typse of parents out there. We’ve ran into a few awesome parents at the park, but the vast majority of them are just as big of a jerk as their kid. Guess the apple doesn’t fall far from the tree, huh? My sweet, loving Nathan has much to learn. So much. It’s been busy, busy, busy around here. From still getting up 1-3 times a night with the baby, to driving Nathan to and from school, to cleaning and organizing, to reorganizing the baby’s room and Nathan’s room, and just about everything in between! Nathan finally got himself a big boy’s bed (as in, a regular twin-sized bed) so we took the toddler bed and turned it back into a crib for John. Nathan loves that John’s taking his daily naps in it! I cleaned and reorganized Nathan’s room from top to bottom and am in the middle of doing the same with John’s room. It’s crazy how hard it is to get seemingly simple tasks accomplished when you have two little ones. Here’s a look into a small fragment of my day. Take mopping, for example. I am loathe to admit how long it’s been since I’ve mopped. Why, you wonder? Well, first I pick up all the toys so I can sweep. After I’ve done that, the baby invariably needs a diaper change or whatnot. After that, he’ll decide he’s hungry, so I feed him. In the meantime, Nathan’s dumped out his legos, brought me plates of food from his kitchen, and scattered clothes and an assortment of toys all over the place. Me telling him to clean up after himself turns into a battle of wills; he ends up getting sent to his room for refusing to clean. Out of principle, I refuse to clean it up for him. I start a load of dishes. Nathan keeps coming out of his room, whining about how he doesn’t want to be in his room, to which I remind him all he needs to do is clean up his mess and he can come out. He stomps out anyway and throws a fit, so I carry him back to his room. He tells me he doesn’t like me anymore. I tell him that’s fine and he can have his opinion, but if he backtalks again then he’ll get more time. He says he wants to be bad and not mind, and when I ask him if he’s sure about that, he screams yes so I give him 5 more minutes in his room. Then the baby starts crying because he needs another diaper change, then after that, John wants to eat some solids. After we’re done, I hear Nathan throwing toys in his room. I go in there and tell him to clean up his mess and he tells me he doesn’t want to mind. I add another two minutes to his room-time. John then starts crying because he wants to be held and hugged, so I spend some cuddle time with him. When he calms down, I go in the kitchen to do dishes, only the water has gotten cold. I empty the water and start over. So at the end of my day, it appears as if nothing has been done.. and it’s driving me crazy because I spend all day long going and going and going. Don’t get me wrong, Nathan is still an incredibly sweet and loving little guy. He’s simply going through the same phase every single other kid on the planet goes through. It doesn’t make it any easier, but I do know that eventually this will pass and he won’t be so damn hard-headed. Oh wait. Maybe that won’t pass… ha ha. As for the baby, I can’t believe he’s is EIGHT months old already… where is time going? Oh, that’s right. I’ve spent the last few months in a sleep-deprived fog. Don’t get me wrong, John’s smile make it all totally worth it, but let’s face it. Getting up to take care of the little fellow 1-3 times a night is draining! He’s loving solid foods. I’m still making them for him as well. Peas, prunes, and pears are his absolute favorites. He’s ok with green beans, can’t decide if he likes bananas, and so far he HATES sweet potatoes. I don’t know why- sweet potatoes are delicious! Hopefully he’ll come around soon. He’s sitting up quite well unassisted, only ocassionally flopping over backwards or to the side. He loves to stand up! He has strong little legs. They’re long and thin, but they can really throw a kick. He’s outgrowing his clothes faster than I can pack them up and get out the next size. Size 6-9 months doeslln’t fit at all, and he just started busting out of his size 9-months. We have a big boy on our hands! I’m simultaneously looking forward to and yet dreading when he becomes mobile. It’s amazing watching him grow, but I am SO not looking forward to chasing him around, wresting objects he shouldn’t be playing with from his spit-soaked little hands, making sure he doesn’t chew on anything that could hurt him, and basically following him around everywhere, whisking him down from the tables and chairs he’ll attempt to climb, putting everything back into the cabinets that he drags out… oh there won’t be a dull moment for sure in this house! Nathan is an AMAZING big brother. He really loves John and likes to help him when John cries. Anything from making silly faces to handing him toys to dancing and singing for him. And you know what? Everytime I see it, my it feels like my heart is going to just explode from all the love I feel. And Nathan being so sweet and doting to the baby (whom he calls “his baby”) makes Nathan’s backtalking totally bearable. Even with all the chaos and a seemingly constantly messy house, I wouldn’t trade my life for anything. Paul and I really love our lives, and we feel blessed beyond measure. I love being mom to my two boys. And I can always catch up on the cleaning when they’re older… right? Right? ?